Can a rapidly growing commercial AR market better position MSFT stock with HoloLens? On Sunday, Microsoft (NASDAQ:MSFT) introduced the second generation of its augmented reality (AR) headset, the HoloLens 2. Aimed at commercial customers rather than consumers, the HoloLens 2 gets a big performance boost, a significant price cut and the option of paying for the device as a part of a low-cost monthly subscription bundle. The company has also landed a big contract with the U.S. government, supplying HoloLens headsets to the army for use in training and on the battlefield — although that agreement erupted into controversy over the weekend. Mobile World Congress 2019 is underway in Barcelona. While new smartphones are dominating the headlines out of the event, Microsoft was there to announce the second generation of its HoloLens 2 AR headset. In addition, comfort was a big focus. Construction this time around features lighter carbon fiber material. The HoloLens 2 has dial-in size adjustment for easier fitting, and the visor can be flipped up without removing the headset. Users can also wear the HoloLens 2 over eyeglasses if needed. Microsoft says these design changes have “more than tripled the measured comfort and ergonomics of the device.” That measurement may be a bit tough to quantify, but the second-generation device is clearly less bulky and easier to put on than the original HoloLens. Perhaps as important as the technical improvements to the augmented reality headset (or mixed reality as Microsoft likes to describe it), the HoloLens 2 gets a significant price cut. At $3,500 it costs considerably less than the $5,000 original. And Microsoft is also continuing its move to offer hardware as part of a monthly subscription. HoloLens 2 is available bundled with Dynamics 365 Remote Assist software for $125 per user per month. When it was first introduced in 2015, HoloLens seemed positioned to take on Alphabet’s (NASDAQ:GOOG, NASDAQ:GOOGL) Google Glass AR smart glasses, and Facebook’s (NASDAQ:FB) Oculus Rift virtual reality headset. Microsoft was talking up a version of its popular Minecraft video game for the HoloLens, which was clearly a consumer play. But no consumer is going to pay $5,000 for an AR headset. Instead, the HoloLens quietly transitioned to the commercial market. That seems like a wise choice. Consumer interest in VR and AR headsets hasn’t yet taken off, with early pioneers like Google Glass dropping out of the race. New competition has also arrived in the form of Magic Leap, and Apple (NASDAQ:AAPL) is suspected to be working on a consumer AR headset. The AR/VR industry is still generating significant revenue, and it’s projected to grow rapidly — but with commercial applications leading the way. According to IDC, worldwide spending on AR/VR is forecast to hit $20.4 billion in 2019, but 64.5% is that expected to be in the commercial sector, growing to more than 80% by 2022. HoloLens 2 is being firmly aimed at the commercial market. At its Mobile World Congress event, MSFT showed off the AR headset mounted to a construction helmet … It’s working with a wide variety of industry partners to deploy HoloLens 2 everywhere from the operating room to automobile assembly lines. In fact, there was some controversy surrounding some of the applications on Friday, after a group of Microsoft employees demanded the company drop its new contract to supply HoloLens headsets for the U.S. Army. MSFT inked a $479 million deal late last year that could see as many as 100,000 HoloLens and HoloLens 2 headsets deployed for Army training and tactical combat use. With the HoloLens 2 — offering big improvements in performance and comfort combined with lower prices and monthly subscription options — Microsoft is well positioned to take advantage of the expected boom in commercial AR spending. While most of its tech giant competitors are chasing the consumer market, MSFT’s AR headset is set to continue winning those big commercial contracts. 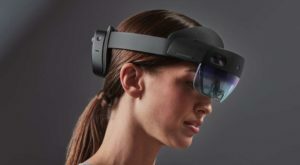 Article printed from InvestorPlace Media, https://investorplace.com/2019/02/microsoft-hololens-2-commercial-ar/.